The fictional detective Sherlock Holmes has inspired dozens of clubs and literary societies, where diehard fans come together to study and exalt all things Holmes. But the Baker Street Irregulars (BSI), an invitation-only literary society, is arguably the best known and most exclusive book club around. Named after the street boys who helped Holmes solve cases in Sir Arthur Conan Doyle's stories, the BSI has been around since 1934. Writer and editor Christopher Morley organized the BSI’s first informal meeting, a cocktail party at a New York hotel, to celebrate the detective’s supposed birthday on January 6. Afterwards, Morley used a Sherlock Holmes crossword puzzle (created by his brother Frank) as a test for entry; people who knew enough Holmes trivia that they could successfully complete the puzzle were invited to be members. Although the first BSI dinner was in December 1934, meetings were sporadic until Edgar W. Smith, a Sherlockian automobile executive, took over the planning of BSI events starting with the 1940 dinner and turned the dinners into an annual event. Today, more than 300 Holmes lovers—Pulitzer Prize winners, authors of Holmes scholarship, teachers, doctors, lawyers, judges, and reportedly even an exterminator—are BSI members. Members past and present have included Conan Doyle’s daughter, Jean Conan Doyle, author Isaac Asimov, editor Otto Penzler, scholar William S. Baring-Gould, and the writer Neil Gaiman. Presidents Harry Truman and Franklin Delano Roosevelt were honorary members, and basketball star Kareem Abdul-Jabbar, who recently wrote a novel about Sherlock Holmes’s older brother Mycroft, attended the 2015 BSI dinner. So what do BSI members actually do? Columnist Michael Dirda, a member of the BSI since 2002, describes the annual weekend each January as a "birthday banquet with lots of toasts and talks." The weekend comprises multiple events, including costume parties, dinners, and speakers. Most of these events are open to all Holmes enthusiasts, and members of multiple Holmes societies, such as the Baker Street Babes, the Bootmakers of Toronto, and the Adventuresses of Sherlock Holmes (a society for female Holmes devotees that emerged in the 1960s because the BSI was men-only until it became co-ed in 1991), attend. At the invite-only BSI Dinner, usually held at the Yale Club, approximately 150 formally dressed BSI members gather to discuss the detective with old and new friends, drink alcohol, and fellowship over dinner with other Holmes aficionados. Lyndsay Faye, a current BSI member, shed light on her 2012 birthday weekend experience, revealing that she got a BSI dinner invitation due to her deep knowledge of and enthusiasm for the Sherlockian canon, her conviviality, and her top-notch "liquor skills"—members are required to toast to Holmes. Members also honor the members who have died in the past year in an event called "Stand with Me Upon the Terrace," and welcome new members (called Irregular Shillings or Investitures). Because one can’t simply apply to join the BSI, those who are invited celebrate their exclusive membership by choosing an alias from a character in the Holmes canon. Faye’s alias, for example, is Kitty Winter, a character from the story "The Illustrious Client." Michael Whelan, the current head of the BSI, discussed in a podcast how his favorite part of the annual dinner is bestowing investitures (announcing new members): "I feel like Santa Claus." But the BSI does more than just party every January. Since 1946, the BSI has published the Baker Street Journal, sharing Sherlockian scholarship roughly every three months. 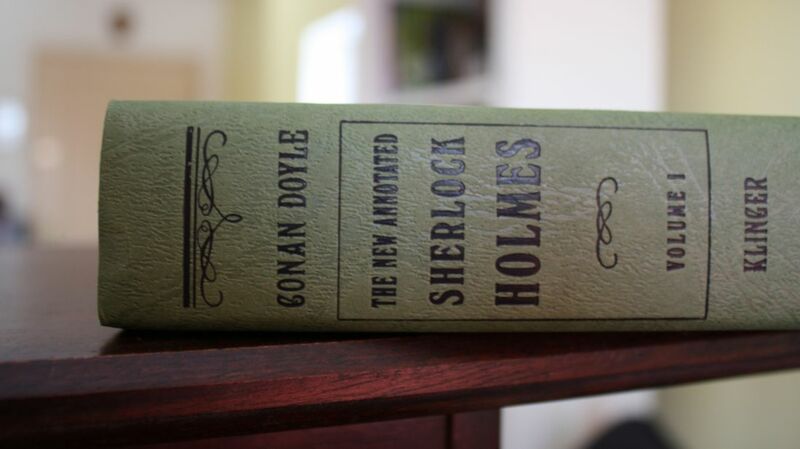 The BSI’s book division sells 40 works about Holmes, and the BSI Manuscript Series provides commentary on Conan Doyle’s manuscripts. Additionally, the BSI International Series offers Holmesian scholarship from around the world (translated to English), including essays by Spanish writers, anthologies by Italians, and articles by Japanese scholars. And thanks to the BSI, there’s an archive at Harvard’s Houghton Library, which includes historical letters, photos, and publications from the BSI’s history. So if you’re a Sherlockian with a strong desire to celebrate the detective’s 163rd birthday, the answer is quite elementary. Take a trip to New York City … the 2017 birthday weekend is January 4-8.